Everyone wants to do better. Trust them. Leaders are everywhere. Find them. People achieve good things, big and small, everyday. Celebrate them. Some people wish things were different. Listen to them. Everybody matters. Show them. The extraordinary power of caring for your people like family. 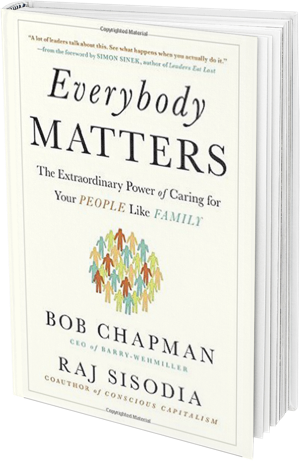 "Bob Chapman, CEO of the $1.7 billion manufacturing company Barry-Wehmiller, is on a mission to change the way businesses treat their employees." Starting in 1997, Bob Chapman and Barry-Wehmiller have pioneered a dramatically different approach to leadership that creates off-the-charts morale, loyalty, creativity, and business performance. The company utterly rejects the idea that employees are simply functions, to be moved around, "managed" with carrots and sticks, or discarded at will. Instead, Barry-Wehmiller manifests the reality that every single person matters, just like in a family. That's not a cliche on a mission statement; it's the bedrock of the company's success. During tough times a family pulls together, makes sacrifices together, and endures short-term pain together. If a parent loses his or her job, a family doesn't lay off one of the kids. That's the approach Barry-Wehmiller took when the Great Recession caused revenue to plunge for more than a year. Instead of mass layoffs, they found creative and caring ways to cut costs, such as asking team members to take a month of unpaid leave. Asa result, Barry-Wehmiller emerged from the downturn with higher employee morale than ever before. The way we lead impacts the way people live.